I’ve been quite surprised by the level of interest in the work around the Landscape Of Trust. I’ve certainly benefited greatly from the support and ideas around the methodology and approach, as well as the input of different perspectives on this subject. Despite having somewhat blundered into this study, I feel it’s now taking shape, and am enjoying the way that each new prototype question unearths a new part of the landscape. This is what research should be like: a process of exciting exploration, with time to enjoy the view along the way. The questions that I’ve been exploring over the last couple of weeks have largely been exploring the relationship between trust in individuals and that between individual and organisation. There are clearly differences between the ways we experience trust in each other, and the ways we experience trust in an organisation, but further than that there is also a degradation of trust as people move further away from our immediate network. So something about proximity may be a clear influence on trust, although conversely something about trust makes it immune to distance. In other words, some individuals seem to be able to maintain strong bonds of trust despite being outside our immediate network. Today’s question is one of a series exploring where trust resides, and it asks the question “is the foundation of your trust in an organisation invested in the contract you have with them, or the people who work there?”. 65% of respondents believe the foundation of their trust is invested in the people who work there, whilst 35% have their trust invested in their contract. This result was not altogether surprising: people trust people, and resort to contracts when things go wrong. A legal contract provides the framework for employment, and maybe a foundation for trust, but possibly only functional trust. Invested trust, that which demonstrates true engagement and added value, may only be invested in people. 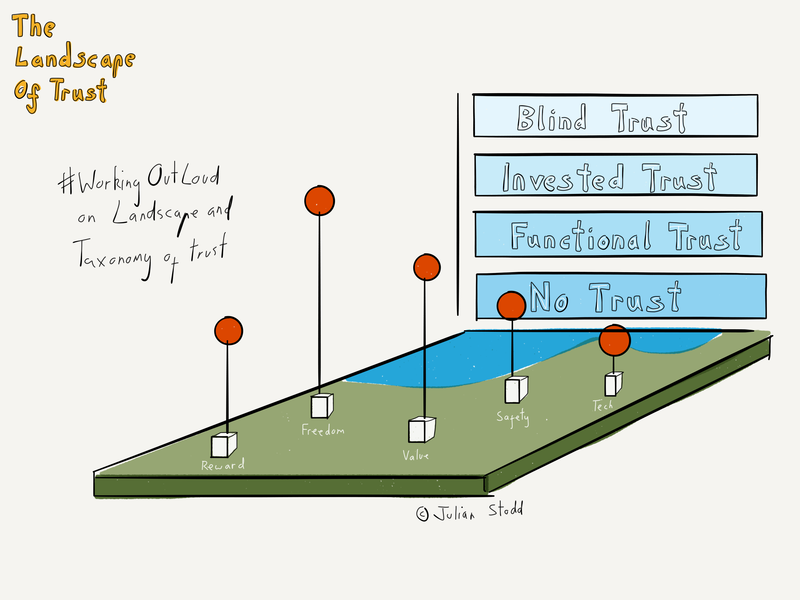 The distinction between functional trust and invested trust is one that I’ve been drawing out as we look at the overall taxonomy: so far, I’m imagining four levels, ranging from a complete absence of trust, through functional trust, to invested trust, and finally blind trust. As ever with these results, the challenge comes in interpretation: are we starting to uncover some native truth, or simply forcing people to think in artificial terms? The one consolation I take is that where there is variance in responses we are most likely seeing hills and valleys in the Landscape of Trust. The overall approach and taking to this research is to keep exploring the landscape until we develop an ability to predict what is over the horizon. For example, in parallel to this I’m also gathering narrative accounts of what trust means to an individual, aiming to gather 100 accounts in the first phase and analyse which words are used to describe trust. I have an expectation that if we ask a second hundred people there will be fewer new words and we will start to derive the skeleton of our map. Whilst trust is subjective, it’s not an infinitely variable field, and I believe we will be able to find commonality, even if our words vary. At the very least, it’s interesting to note that for some people, trust resides within the contract. It will be interesting to explore if that is because their trust in people has failed, or simply that they see contractual trust as a foundation for the invested trust that they can hold in people. In other words, we could read this result in two ways: the first, that where trust resides in the contract, trust has failed in people, the second, that the 65% of people who invest their trust in other people are missing a foundation of contractual trust. Ambiguity and uncertainty are ever the enemy of clarity. I’ll continue to #WorkOutLoud as i explore the Landscape of Trust further. This entry was posted in Trust and tagged Community, Contracts, Control, HR, Landscape of Trust, Leadership, Networks, People, research, Social Leadership, Trust. Bookmark the permalink.